Problems occur when termites attack the wooden elements of human structures – homes, businesses and warehouses. Their presence is not readily noticed because they hide their activity behind wallboards, siding or wood trim. Homeowners in all areas of Texas should watch for subterranean termites and take precautions to prevent infestations. To minimize damage from termites, it is helpful to know the description and infestation signs of termites. Each year we receive hundreds of calls in the spring and fall from people who are concerned they have termites swarming. In some cases the winged culprit is a swarming ant. 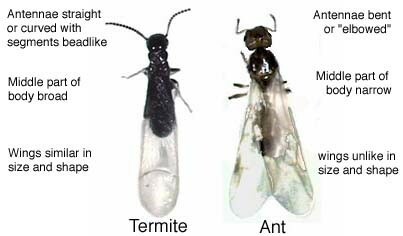 The differences between a winged ant and a swarming termite are shown below. The bodies of termite swarmers are black while ant swarmers may be brown, black or red. Termite swarmers are typically much smaller than ant swarmers and have a much shorter life span out of the soil. In addition, termite swarmers have straight antennae, no constriction at the waist and both pairs of wings are equal in size. If you are still unsure what insect you have found, give us a call or send us an E-mail. We can set an appointment to have one of our termite professionals help you determine if you have termites or any other infestation. 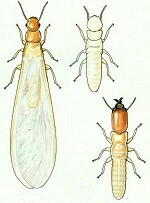 Termite reproductives form new colonies through “swarming”. 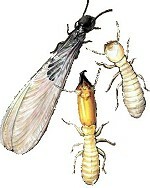 The swarming termites develop during winter months. Usually in the spring during warm and humid weather, worker termites will build special tubes called “swarming castles” and prod the swarmers out for mating. Swarming typically last for around 30 minutes. Although these reproductive termites are a nuisance, they are actually doing homeowners a favor. In many cases, swarming termites are the first signs that a home is infested with termites. Because termites can destroy wood completely out of our sight year round, these winged termites are an important signal. Swarmers do not cause any damage. Their purpose is to start new colonies. Indoor swarmers will die within a few hours therefore we do not recommend the use of pesticides. You should wait until they die, then you can sweep or vacuum them up. Very seldom are indoor swarmers successful in starting a new colony (termites must find sufficient moisture inside the structure). Sometimes termites swarm inside your home just briefly, die and then you do not see them again. Some people make the mistake of thinking the termites went away or maybe the pesticide they sprayed where the swarmers were emerging solved the problem. Sorry to say it is not that easy. Swarmers only emerge briefly during the right environmental (temperature, light and moisture) conditions. You may not see them again until the next year. However, the worker termites in the colony will still be feeding on your home if they are present like the swarmers suggest. Subterranean termites can form tunnels through cracks in concrete, so slab homes are not exempt from these termites. They need to stay in contact with the soil in order to survive, unlike drywood termites that only need low moisture. The size of a worker is 1/8- to 3/8-inch in length. The soldier body is similar to that of the worker, but large, deck head with powerful mandibles. The color of a worker is pale, cream colored. Soldiers are light colored with brown head. Reproductives (Queens and Kings)- have four wings all the same size with dark veins in the front portion of the front wing. They develop from alates or swarmers. Their sole purpose is to produce eggs. The reproductives survival rate can be as long as 25 years. The wings are semi-transparent, foggy white color and covered with tiny hairs. They swarm at night and are attracted to lights. The queen can lay up to 2,000 eggs a day. Alates form when a colony has increased. If the king or queen dies, or if part of the colony is withheld from the parent colony they can form a secondary reproductive which creates multiple kings and queens. Soldiers- The head of the soldier is rounded then narrows toward the front, unlike the native subterranean that has a more boxed-shape head. Due to their scissor like mouth functions they have to be fed by the workers. One of their objectives is to guard the colony from ants or other insects. When disturbed they emit a milky white fluid from the opening where as native soldiers do not eject any substance. They make up about 10% of the colony. There are more soldiers to a Formosan termite colony than to a native subterranean colony. Workers– Are a cream color, which can make it hard for you to distinguish from other termites. Unlike native subterranean termites who can average a few hundred thousand workers, the Formosan termite colony can exceed up to a million. The workers, who you can also call multi-taskers form the nest, gather food, feed others, and mother the eggs and young. Their mouths are made for chewing and tunneling, causing the most significant damage.